For those of us who work in the luxury lifestyle industry, the 2015 Luxury Interactive summit in New York City is shaping up to be one of the year’s must-visit events. Situated in the venerable Time-Life Building in Rockefeller Center from October 13th-15th, this conference boasts 3 jam-packed days of speeches, panels, and discussions focused on luxury branding in the digital age. Considering there’s no better way to keep tabs on the latest digital marketing strategies than hearing about them from industry leaders themselves, this conference is a great way to stay ahead of the curve – and ahead of the competition! 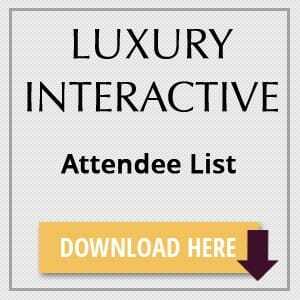 There are currently 70 industry leaders confirmed to be speaking or leading discussions at Luxury Interactive this year, and more could be added over the coming months. At this point, the list of industries being represented on the agenda is quite impressive indeed, ranging from fashion and beauty to travel and hospitality and everything in-between. Beyond simply listening to speakers, attendees will also have the opportunity to set up one-on-one meetings with speakers through Luxury Interactive’s new mobile app. Perhaps best of all, attendees can even take part in champagne roundtable discussions to discuss their unique branding goals with other industry professionals – and enjoy some fine drinks while they do it! If you would like to register to attend Luxury Interactive, inquire about becoming a speaker or exhibitor, or simply learn more about this huge conference, just head on over to their website and don’t forget to join their LinkedIn group if you’re active there as well. You can also follow Luxury Interactive’s Twitter account @luxinteractive for more updates.